Diary, blog or podcast? - MacJournal is the solution. A special birthday. A graduation. A child's first word. A gathering taking place far away from home. Life is filled with events. Some are happy, some sad, some are utterly life-changing. Don't let these moments fade - keep them all alive in MacJournal. We've created and designed MacJournal, the world's most popular journaling application for the Mac, so that you can start writing and express yourself the moment you launch it. Easily create a journal - for your dreams, your family or a special time of life - anything. Then, take the plunge and write your entry. It can be your first thoughts of the day, a summary of a good book or just to unload from the week. With MacJournal, the only limitation is the one you set for yourself. Life is more than just words! There's color, sound and imagery and you can put all of it into your journals with MacJournal. A Media Browser is included which allows you to select a favorite song from iTunes, a photo from your Pictures library - even a YouTube video - and add it to an entry. Your journals will be as rich with sight and sound as the event itself. MacJournal is packed with so many features and enhancements that you can turn it into your own personal writing playground. Select one of the many icons included to mark your entries and journals or use one of your own. Add a mood - are you happy or just so-so? Sort your journals by Topic, Date, Mood, Content Size and more. If you're the business type, you can use the Statistics menu to view Words, Characters and Lines in an entry. If you like a disciplined approach to your journal keeping, set aside time every day to write and use the Timer to monitor yourself. When you want to see just how prolific a writer you are, select the Timeline Mode to view your daily writing activity chronologically, or the Calendar Mode to see your entries by month and year. There's also a Full Screen Mode to give you a full writing landscape for all your thoughts choosing your own color background and your own color of type. Let your writing canvas be as unique as the words that will go on it. If you like an audience...or not. You can keep your world private or, like so many do, share your thoughts and opinions or your entire life. Your MacJournal entries can be published to any of the popular blogging services like Blogger, WordPress, LiveJournal, Tumblr and more. But, if you want to keep your thoughts away from prying eyes - don't worry, MacJournal is equipped with two-level security - password protection and AES-256 encryption. Extroverted or introverted. Open or private. Just pick the way that's right for you. 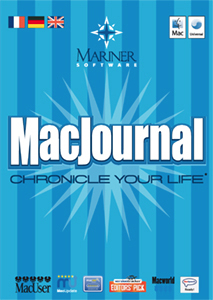 With all the features in MacJournal, you will find that starting and keeping a journal for yourself personally, for school or business, can be as fun and entertaining as it is serious. Added "New entry from Web Page"